The Turk’s Head should need no introduction to Beatles Fans, but to refresh your memory, it is well known for the filming of the scene in “A Hard Day’s Night” where Ringo, dressed as a tramp to escape the fans, attempts to play darts. In fact the whole area is awash with Beatle film sites, particularly from “Help”, which was filmed in many of the nearby streets and of course, Twickenham film studios, where many interior shots were filmed for “Help” as well as the infamous “Let it Be” sessions in 1969. 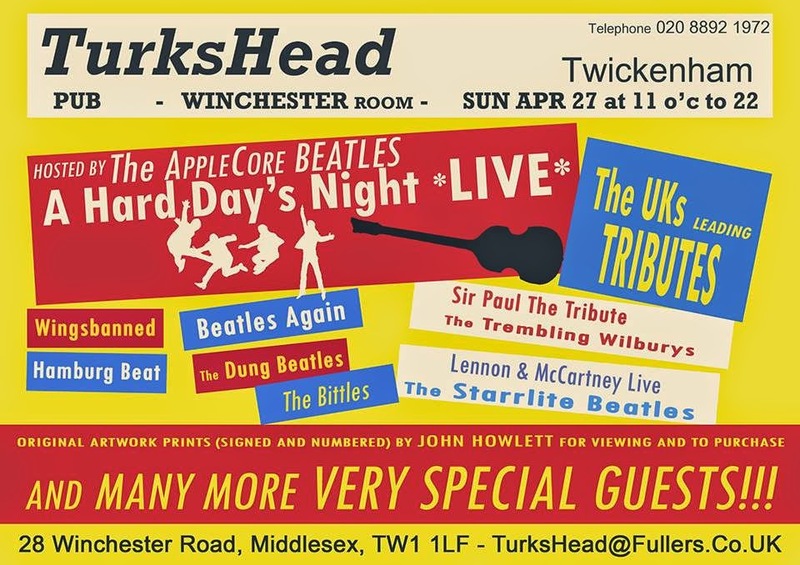 The Winchester room in the Turk’s Head played hosts to The Beatles for their party in 1964 after “A Hard day’s Night” had been completed. To celebrate the event some 50 years ago (yes 50! 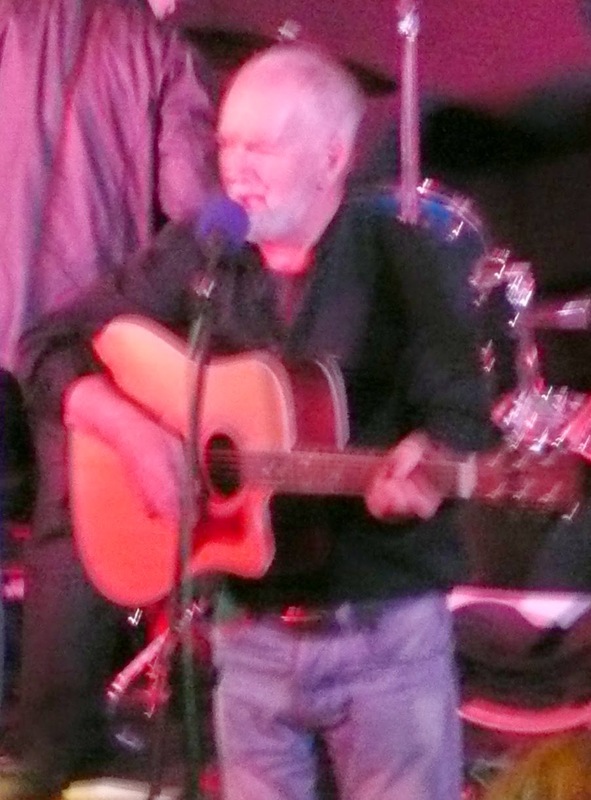 ), Dan Richards of the Apple Core Beatles organised a day of Beatles tribute bands. 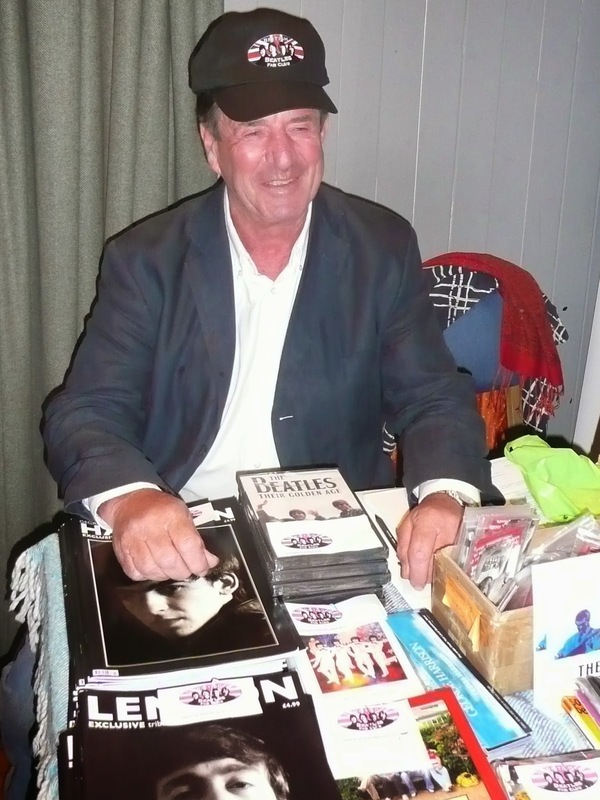 The BBFC were there as well as a number of merchants selling Beatles items. Doors opened at 11am and a steady flow of fans came and went throughout the day. Although the music started late, there were some great tribute bands covering the whole of the Beatles’ repertoire and more. We were treated to “Beatles Again”, who played songs from 1963, The DB5’s, Sir Paul The Tribute, The Fab Twins, doing a great acoustic set with some help from their friends, The Bittles, Hamburg Beat covering the Hamburg period and performed some songs I had never heard before. Wingsbanned covered the Wings era, The Trembling Wilburys did a superb set of Wilbury/George numbers, and this band gets better all the time. The Starrlites covered the 1968/69 period before the final act of the night, The Dung Beatles who rocked to songs from 1965 and 1966 with a touch of Sgt Pepper added. Not officially on the bill but always a treat to see and meet was Rod Davis, an original Quarryman who was replaced by Paul McCartney, who played several songs from that skiffle period. For me the Trembling Wilburys were superb as were the Dung Beatles, who closed the event, but all the bands who were there deserve a lot of credit for their performances and each and every one played their part in a superb day. By the time the curtain came down it was 10.40 in the evening and we had seen some wonderful bands and had a great day. In between there was a Question and Answer hosted by Richard Porter. Richard interviewed Andrew Lancel, the star of “Epstein the man who made the Beatles”, the new Epstein play transferring from Liverpool to London in August. The only let down here was that the mikes weren’t loud enough to cover the entire hall. It was a pity that other Beatle celebs who were there weren’t invited to do a Question and Answer session as well. We would have liked to hear from Rod Davis, Leslie Cavendish (The Beatles Hairdresser at Apple), Jeni Crowley (who worked at Apple and for the original fan club). Both Leslie and Jeni appeared in “Magical Mystery Tour” and must have some wonderful memories to share. Others at the event include Gail Renard, who attended the John and Yoko Bed In in 1969 and has written her book “Give Me a Chance”, and Kevin Roach, who has studied the Beatles families and was promoting his new book “That’s The Way God Planned It” focusing on George Harrison’s family. This follows on from his book on the McCartneys- “In the Town Where They Were Born”, reviewed in a previous BBFC magazine. The event was a huge success and will hopefully be repeated. It was good to see some BBFC members who had made particularly long journeys at the event. Dan Richards of the Apple Core Beatles tribute band did a superb job to put the entire event together and it was a pity that his band was in the end unable to play at the gig. A huge thanks to Dan and to everyone else involved in organising the event, and to the Turk’s Head for their hospitality on the day. We (the Trembling Wilburys) had an amazing time and were overwhelmed by the lovely reception from all the Beatles fans!